Do not place anything on the dash panel. These objects might slide or fall down while you are driving (under acceleration or when cornering) and could distract you from the traffic - there is a risk of an accident. Make sure that no objects from the centre console or from other storage compartments can get into the driver's footwell while you are driving. You would then no longer be able to apply the brakes or operate the clutch or accelerator pedal – there is a risk of an accident. Pull the cover handle in the direction of the arrow » Fig. 83 and fold down the cover. Lift the lid upwards until it clicks into place. A pin holder is located inside the lower flap. 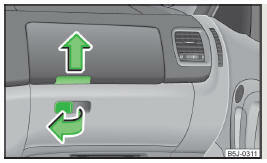 The storage compartments must always be closed when driving for safety reasons. Use the rotary switch » Fig. 84 to open and close the air supply. Opening the air supply when the air conditioning system is switched on allows cooled air to flow into the storage compartment. Opening the air inlet when the air conditioning system is on causes fresh or interior air to flow into the storage compartment. We recommend closing the air supply if it is operated in heating mode or the cooling system for the storage compartment is not being used. The open stowage compartment below the light switch » Fig. 85. 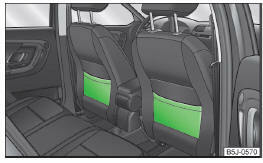 Map pockets are located on the rear of the seat backrests Fig. 86. The map pockets are intended for storage of maps, magazines, etc. Never put heavy items in the map pockets – risk of injury. Do not put any large items such as bottles or sharp objects into the map pockets, as the pockets and the seat covers could be damaged. Press on the bar in the cover of the glasses storage. The compartment folds down » Fig. 87. 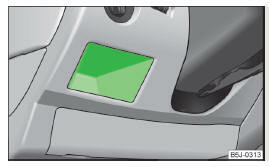 The compartment must only be opened when removing or inserting the spectacles and otherwise must be kept closed. Do not put any heat-sensitive objects in the glasses storage box - they may be damaged. 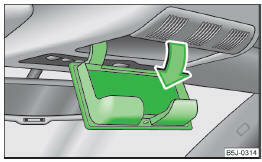 The maximum permissible load of the glasses compartment is 250 g.
The open stowage compartment in the centre console » Fig. 88. Pull the handle to open the lid » Fig. 89. When closing the lid, hold the handle until the compartment is closed. The storage compartment must always be closed when driving for safety reasons. The storage compartment is designed for storing small objects of up to 1 kg. in weight. Press the lower button on the end of the armrest » Fig. 90 - A. Fold the arm rest forward and release the button again. 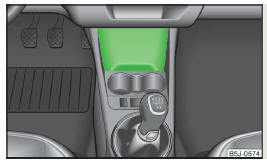 Press the upper button and open the cover of the stowage compartment upwards » Fig. 90 - B. The moving space of the arms can be restricted if the armrest is folded forwards. 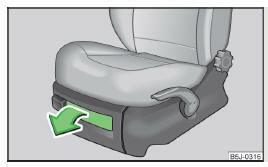 In city traffic the armrest should not be folded forwards. There is a bottle holder at B » Fig. 91 of the pocket in the front doors. Use the section A » Fig. 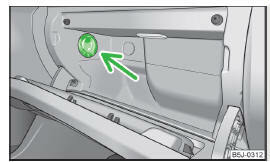 91 of the door pocket only for storing objects which do not project so that the effectiveness of the side airbag is not impaired. 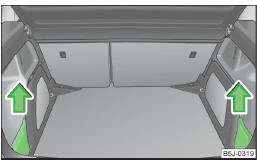 The cover for the side compartment can be removed, thus enlarging the boot. Grasp the top part of the cover and carefully remove it in the direction of the arrow » Fig. 92. The storage compartments are designed for storing small objects of up to 2.5 kg. in weight in total. The flexible storage compartment » Fig. 93 can be fitted to the right-hand side of the luggage compartment. 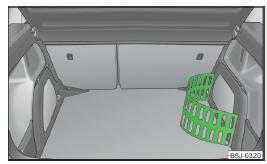 Insert both ends of the flexible storage compartment into the openings of the right side trim panel of the boot and push it downwards until it locks. Grasp the flexible storage compartment on the two upper corners. Remove by pulling towards you. The storage compartment is designed for storing small objects with a maximum total weight of 8 kg. If the variable loading floor » page 73 is installed in the luggage compartment, no flexible storage compartment can be installed.